IMAGINE . . . getting lost in a one-room flat; seeing auras; never forgetting a moment; a permanent orchestra in your head; turning into a tiger; life as an out-of-body experience; feeling other people's pain; being convinced you are dead; becoming a different person overnight. Our brains are far stranger than we think. We take it for granted that we can remember, feel emotion, navigate, empathise and understand the world around us, but how would our lives change if these abilities were dramatically enhanced - or disappeared overnight? Award-winning science writer Helen Thomson has spent years travelling the world tracking down incredibly rare brain disorders. In Unthinkable she tells the stories of nine extraordinary people. From the man who thinks he's a tiger to the doctor who feels the pain of others just by looking at them, their experiences illustrate how the brain can shape our lives in unexpected and, in some cases, brilliant and alarming ways. Delving into the rich histories of these conditions, exploring the very latest research and cutting-edge medical techniques, Thomson explains the workings of our consciousness, our emotions, our creativity and even the mechanisms that allow us to understand our own existence. 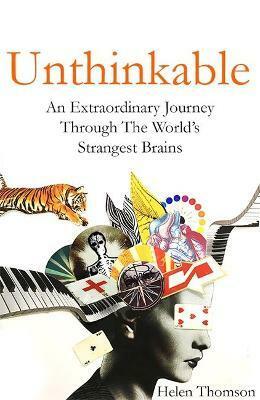 Story by remarkable story, Unthinkable takes us on an unforgettable journey through the human brain. Discover how to forge memories that never disappear, how to grow an alien limb and how to make better decisions. Learn how to hallucinate and how to make yourself happier in a split second. Find out how to avoid getting lost, how to see more of your reality, even how exactly you can confirm you are alive. Think the unthinkable. Helen Thomson is a writer and consultant with New Scientist. She has also written for the Guardian, Daily Mail, BBC Future and Psychologies and has won various awards for her journalism. Her research has taken her from coffee with five psychopathic mass murderers in Broadmoor to poking around in the Large Hadron Collider. She has exclusively revealed plans for the world's first head transplant, learned how to rule at roulette, had her fat zapped, scrubbed up for a cutting-edge prostate cancer operation and watched a paralysed man walk for the first time using a mind-controlled exoskeleton. But her greatest fascination remains writing about the brain, especially those that don't look like everyone else's. Helen has a BSc in Neuroscience and an MSc in Science Communication. She lives in London. This is her first book.